This morning crowds thronged the banks of the Seine to witness the damage for themselves, after hundreds of firefighters battled the inferno through the early hours of Tuesday. A full investigation has been launched into the cause of the fire, which prosecutors say was started accidentally. Authorities are examining whether it began on the roof, which construction workers were renovating. Engineers will conduct a full assessment of the damage and the integrity of the surviving structure. “The worst has been avoided,” said French president Emmanuel Macron, who rushed to the scene, pledging to restore the 850-year old cathedral he said was integral to the country’s heritage and identity. The Foundation for French Heritage has launched a national collection to raise funds for the restoration, while two of the country’s wealthiest men, billionaires Bernard Arnault and Francois Pinault, pledged 300m euros ($340m) from their fortunes. Churches across the country rang their bells in mourning and solidarity last night, signalling a profound loss that transcends France’s strict division between religious and secular life. Notre Dame has survived centuries of war, plague and revolution, surveying Paris from its island perch on the river Seine as it grew from a provincial city to the capital of European culture and politics. It was the scene of Napoleon’s coronation as emperor, the inspiration for Victor Hugo’s classic novel ‘The Hunchback of Notre Dame’, and today draws 12 million tourists each year, almost twice the number that visit the Eiffel Tower. “Notre Dame is burning, France is crying and the whole world, too, is extremely emotional,” the Archbishop of Paris Michel Autpetit told reporters last night. Parisian Thierry Nico was relived to see the familiar facade of Notre Dame greet him when he arrived this morning. “We know that probably she will be like before yesterday in 10 years, 15 years, maybe five years, but anyway the structure seems quite solid. I’m emotional but happy,” he told Al Jazeera. On Monday evening 16:50 GMT the fire broke out in the attic of the cathedral. 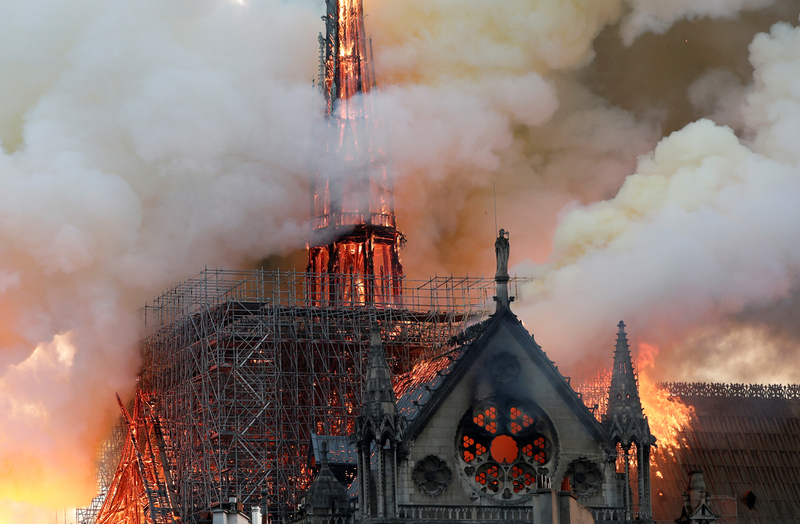 The blaze consumed the roof and the eight-centuries-old cathedral’s spire before fire fighters brought it under control, saving its bell towers and outer walls. Paris fire brigade chief, Jean-Claude Gallet, said the structure, including its two front towers were saved “and perserved as a whole”. 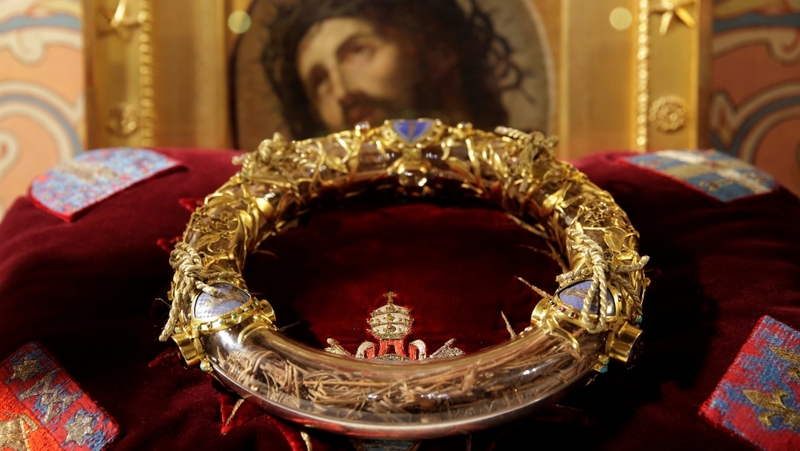 The Holy Crown of Thorns and a sacred tunic worn by 13th-century French king Louis, two irreplaceable artifacts, were rescued. Groups and individuals are mobilising to help rebuild the damaged parts of the cathedral. Hundred of millions have already been pledged. The Fondation du patrimoine, a hertitage organisation, will launch a “national collection” for the reconstruction of Notre Dame, Anne Le Breton, deputy mayor of the French capital’s 4th arrondissement, said. French billionaire businessman Bernard Arnault’s family and his LVMH luxury goods group will donate 200 million euros ($226m) to help repair Paris’ Notre –Dame cathedral. Former US President Barak Obama said that Notre Dame was one of the world’s great treasures.